Peripheral artery disease (PAD) of the lower extremities is a common cause of impaired ambulation and is a leading cause of lower extremity wounds and amputations. It is also associated with atherosclerosis elsewhere in the body. Thus, individuals with PAD are at significantly increased risk of cardiovascular and cerebrovascular events and mortality. There is substantial evidence that the majority of cases of PAD go undetected in routine clinical practice. As a result, there is considerable interest in detection of PAD through routine screening. Whenever one suspects Peripheral Arterial Disease (PAD), the clinician must perform few non-invasive vascular testing methods that are commercially available and widely implemented. They include the ankle brachial index (ABI), the toe-brachial index(TBI), segmental Pressure Study and pulse volume recording(PVR). Who is at risk for peripheral arterial disease? Symptoms of poor kidney circulation include sudden high blood pressure, or blood pressure that is hard or impossible to control with medications. Severe blockage of the kidney arteries may result in loss of kidney function or failure. Is peripheral artery disease dangerous? Yes. In PAD, fatty deposits build up in the inner lining of artery walls. These blockages restrict blood flow, mainly in arteries leading to the kidneys, stomach, arms, legs and feet. Left untreated, PAD can lead to gangrene and amputation of limbs. If the blockage occurs in a carotid artery, it can cause a stroke. Most patients with PAD have a higher risk of death from heart attack and stroke. People with Diabetes having PAD have a very high risk of complications. Diagnosing PAD begins with a medical history and physical exam. The digital arteries in great toes are considered to be less affected by medial arterial calcification. One would calculate TBI by dividing the blood pressure of the great toe by the systolic brachial blood pressure. Toe pressure of > 55mmHg is considered normal. Toe pressure < 30 mmHg is considered severely ischemic. Measurement of Toe systolic pressure drastically improves the reliability of distal blood pressure especially in diabetes. It is also useful for the diagnosis of critical limb ischemia and also assessment of healing potential of ulcers. TBI less than 0.7 is considered abnormal. Low Toe-Brachial Pressure Index (TBI) Predicts Increased Risk of Recurrent Cardiovascular Disease in Type 2 Diabetes. Once the ABI has been performed, segmental limb pressure measurement can aid in localizing stenosis or occlusions. Limb pressure cuffs are placed on the thigh, below knee, ankle and digit. The pressure at each segment is measured. A difference in pressure of >30 mmHg between the cuff sites suggests a significant arterial stenosis or occlusion present between the site. Pulse-volume recordings (PVRs) are plethysmographic tracings that detect changes in the volume of blood flowing through a limb. 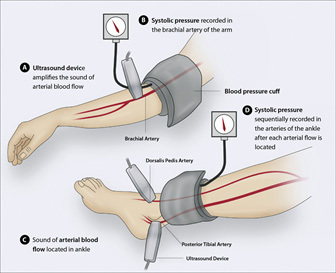 Using equipment similar to the segmental limb pressure technique, pressure cuffs are inflated to 65 mm Hg, and a plethysmographic tracing is recorded at various levels. A normal PVR is similar to a normal arterial pulse wave tracing and consists of a rapid systolic upstroke and a rapid down stroke with a prominent dicrotic notch. With increasing severity of PAD, the waveforms become more attenuated with a wide down slope and, ultimately, virtually absent waveforms. There has been much recent interest in the relationship between arterial stiffness and cardiovascular disease. Surrogate measures of arterial stiffness indicate that arterial stiffness increases both with age and in certain disease states that are themselves associated with increased cardiovascular risk, including hypertension, diabetes mellitus, hypercholesterolemia and end-stage renal failure. As changes can be detected before the appearance of clinically apparent vascular disease, arterial stiffness may act either as a marker for the development of future atherosclerotic disease, or may be more directly involved of the process of atherosclerosis. Pulse Wave Velocity is the propagation speed of this wave along the arteries. Increased stiffness of the arteries increases Pulse Wave Velocity. Age and systolic pressure strongly correlate with PWV. In fact, the most important factor contributing to increase in PWV is age because of increased arterial stiffness caused by medial calcification and loss of elasticity. Heart rate is the frequency that the heart beats, and is an indicator of physical fitness. The more active you are, the lower your heart rate is. Blood pressure measures the pressure of blood on the arterial wall. It is one of the major cardiovascular risk factors, and can lead to an increased risk of stroke, heart failure, and kidney failure. While heart rate and blood pressure measurements are useful in evaluating cardiovascular health, they do not give a complete picture of health. Pulse Wave Velocity, on the other hand, is an accurate stand-alone measurement of heart health. What does the Pulse Wave Velocity say about my health? Measuring Pulse Wave Velocity is recognized by the medical community as the best way to assess cardiovascular health, because it takes both arterial health and blood pressure variations into account. Diseases such as diabetes, cholesterol or high blood pressure induce stiff arteries, which lead to an elevated Pulse Wave Velocity. An elevated Pulse Wave Velocity is a sign of poor heart health, indicating a risk of having or developing high blood pressure. On the other hand, the more flexible the artery, the better your heart health. What are the pathologic risks associated with high Pulse Wave Velocity? Medical research has demonstrated a strong correlation between the stiffness of the arteries and the risk of a cardiovascular incident. Stiffer arteries indicate a greater risk for high blood pressure, stroke or heart attack. Pulse Wave Velocity has been proven to be as reliable as the Framingham risk score, which is currently the most common way of predicting one’s risk of cardiovascular incident. Unlike the Framingham risk score, Pulse Wave Velocity is a direct measurement of your cardiovascular health. Can I improve my Pulse Wave Velocity? The good news is that you can decrease your Pulse Wave Velocity with healthy lifestyle changes. If you are overweight or obese, losing weight can have a tremendous impact. Engaging in physical exercise, and limiting salt and alcohol intake may also help to decrease your Pulse Wave Velocity. Additionally, managing stress can help you avoid elevated heart rate and blood pressure readings that can hurt your arteries over the long term. The number of candles on your birthday cake may add up to your chronological age, but it doesn’t necessarily equal your biological age: environmental factors, such as stress and diet, and genetics can speed up or slow down how the body ages. Why is vascular age important? A person whose vascular age is older than his or her chronological age may be at increased risk of developing cardiovascular disease later in life. The effects of early vascular aging may best be managed by early intervention.